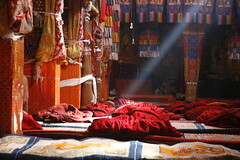 Yesterday we went to the Ganden Monastery which is 2 hours drive outside of Lhasa Tibet. 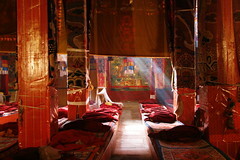 It was the first Tibetan monastery that I felt was truly alive, many others felt like relics to me. It was on the top of this 'hill' at 4400 meters. Vultures circled overhead so they can't have been feed recently at the sky burial because apparently they cant fly for a day after gorging themselves on dead people. Like all the monasteries it was full of various statues and holy relics but the bit I liked best was the Assembly Hall where all the monks gather for 'stuff'. It was full of smoke and the light streamed in from the top windows. It was great for slow shutter speeds so I whipped out my tripod and paid my 20rmb to the monk and clicked away. 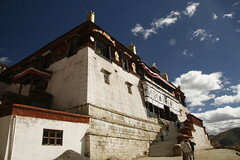 This whole monastery had to be rebuilt after the cultural revolution as it was used as target practice by the Chinese heavy artillery. Hope you like the pics =) click on them to see larger ones.